Next door's cat has taken to stalking birds. Dave intervened to get him to drop a young thrush on Saturday. Once the cat had been forced to retreat, we stepped in to see what we could do for the poor bird, but alas it was very young, in severe shock and sadly, it died. Imagine our surprise on Sunday when our neighbours knocked on the door to report their cat had done it again. There was a bird in their kitchen and they expected Dave to do something about it! Dave (bless him), tried to pass the responsibility back to them by handing them a shoe box. A few minutes later, they knocked again and gave the shoe box back, complete with a bird inside. I'm not sure when it became our responsibility to take care of baby birds brought in by their cat, but when faced with someone thrusting a hurt bird at you, it is hard to know how to react. So it was, we acquired our second bird in less than 24 hours courtesy of the neighbour's cat. 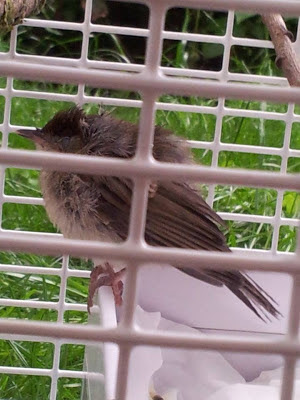 This one looked ruffled, missing a few feathers and appeared to be a bit stunned, but was older so we hoped it might be OK. We made a tentative identification as a chiffchaff and then put it in a covered cat carrier with some drinking water and waited to see if it would perk up. A couple of hours later, it looked considerably brighter, was responding to our presence and trying to perch. 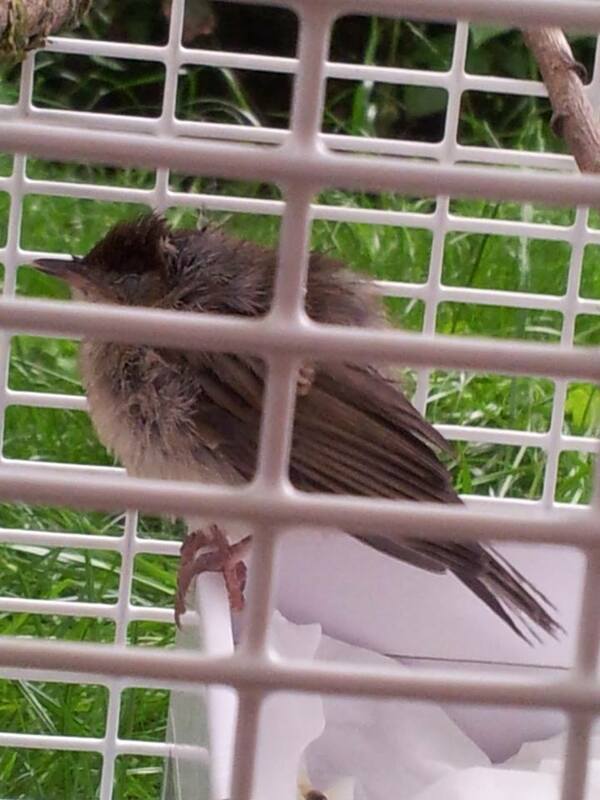 Heartened that it might survive, we checked again, posted a pic on a Facebook wildlife page and discovered this was a blackcap. We added some twigs and blueberries, then had the dilemma of what to do with it. Wild birds are just that, wild... And we had no desire to keep one captive, not to mention that having two cats of our own, our house would undoubtedly be a stressful environment for our unexpected guest. We've taken wild animals to the PDSA and RSPCA before, but not been happy as we're fairly sure they've been euthanased, so we decided to look for a local wildlife sanctuary. Our first thought was to call Brandon Marsh to ask for advice, but it being Sunday, no one answered the phone, hence we took to the internet and found the Nuneaton and Warwickshire Wildlife Sanctuary. We sent them an email, then Dave tried the phone and was surprised when someone answered. Even better, yes they were happy to take the suspected Blackcap. Cue a Sunday evening dash to Nuneaton, with M in tow because she insisted she wanted to come too. We got lost. Horribly lost in that I knew exactly where we were and where we wanted to go, but had no idea how to get there as we were trapped inside Nuneaton's one way system! M was being very patient and singing to the bird (after I explained that I wouldn't put a CD on in case it frightened the bird), her song of choice being Soldier, Soldier. M kept asking if we'd reached Nuneaton yet so I said we were there, but I was a bit lost and I was trying to get us to the wildlife sanctuary. M offered the eminently sensible suggestion that we should go home. In the end, by pure cunning and stubborn determination I ended up on the correct bit of one way street heading towards the wildlife sanctuary which is based in an unassuming bungalow. Once there, we got the bird out of the car, still in its improvised cage and headed inside (with me hoping they hadn't had a call out in the time it had taken us to get there). Fortunately, someone came when I rang the bell and in we went to immediately encounter a young deer blocking our path. It was quite literally standing there, being nosy and forcing us to walk around it so it could get a good look at us. M was shorter than the fawn so asked (not unreasonably) if it was a horse. We were shown into a shed where a young fox sat watching in a puppy cage where it apparently sleeps. The shed floor was very springy, so bouncing expert that she is, M started vigorously jumping up and down. I scooped the excited small person up before she frightened the fox and showed her 'our' bird which was briefly examined before being whisked away to the reptile shed where it is nice and warm. Apparently they had several fledglings there so it would have company while it recovered. M was very concerned that the bird had been taken, but was finally reassured that it was in the best place and that this was an animal hospital. I carefully explained that normally, if we found a baby bird we'd take it back to its mummy and daddy, but since the cat didn't tell us where he found the bird we couldn't do this. That was why we'd brought the bird to a animal hospital and they'd look after it now. Mission accomplished and I now know where the Nuneaton wildlife sanctuary is although I can't guarantee I wouldn't have similar problems navigating my way there again. Personally though, next time the neighbour's cat brings in a live bird, I intend to hand over their contact details along with a shoebox!